Maximizing Opportunities – The NorQuest Campaign will raise $20 million to support students and build the Singhmar Centre for Learning, making a profound and direct difference in the lives of our students and positively affect the communities where they live, work, and raise their families. You can be a part of this exciting and transformational project. NorQuest College is a leader in providing the skills and language training needed for internationally educated students to use their talents to benefit our communities and unlock their full potential. Your contributions will ensure NorQuest will continue to be there to support their journey, eliminating language, intercultural, and communication barriers, and opening doors for people from all walks of life. NorQuest is a college that not only respects the cultural significance and social impact of Canada’s Indigenous Peoples, we strive to provide them with meaningful training and workforce opportunities. When we share Indigenous culture, history, and traditions and incorporate them into education, we improve access and outcomes for everyone. Your contributions will ensure that we can continue this important work. NorQuest College sees and maximizes potential in students where many others see only barriers. We deliver education one student at a time, touching every corner of our community and strengthening the quality of life for all of us. Our graduates power the front lines of health care, g energy and skills to businesses, and support vital community services. Your support ensures NorQuest can continue to meet the demands for skilled employees and be nimble in creating new career opportunities as our economy demands. NorQuest College's campuses are inclusive and welcoming to learners from all walks of life and cultures, all of them with a similar goal: to make a better life for themselves and their families. Giving learners access to relevant and necessary education is a gift that will create a lasting legacy for you and for families who gain a higher quality of life. With your support, we will provide scholarships, bursaries, funding for further program developments, and expansion of services to support all students on their paths. The Singhmar Centre for Learning is a transformational project for NorQuest College and our students. The demand for our programs and the attraction of our workforce-relevant and inclusive learning environment has never been higher. We need our facilities to meet these needs. Help NorQuest continue to be the place where students from all backgrounds, experiences, and cultures can flourish. Together, we can build a strong province for future generations. Your support creates a ripple effect—enabling more students to enrich their lives and in turn profoundly influence their families, community, and the future economy of our province. Allowed every opportunity to succeed as a young woman, Dr. S. Ann Colbourne flourished and achieved her lifelong goals. In a perfect world, everyone would be so lucky. In Dr. Colbourne’s world many will, thanks to her generosity and support of NorQuest College’s 1000 Women: A Million Possibilities fundraising campaign. The 1000 Women movement is a powerful example of women working together for the betterment of the community by raising money to help support the programming and infrastructure needs of NorQuest College, where 63 per cent of the student population is female. Since she began practicing medicine in the early 1980s, it has been Dr. Colbourne’s job to diagnose and address the things that make people ill. Her perspective has allowed her to look outside the physical health symptoms and discover a deeper definition of a healthy population. “I’ve seen some incredibly talented people go home at the end of the day and have another very demanding job to do there too,” says the doctor, whose only ‘children’ are three West Highland Terriers. However, having spent considerable time caring for her parents at the end of their lives, she understands the challenges of balancing family and work commitments. For her generosity and efforts, the Dr. Ann Playroom in the 1000 Women Child Care Centre located in the new Singhmar Centre for Learning has been named in her honour. 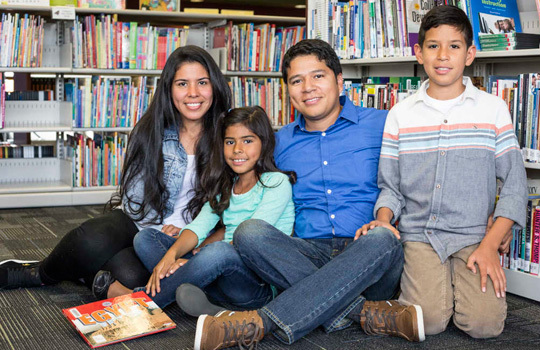 NorQuest Academic Upgrading student Willy Poveda and his family. New Canadian Willy Poveda can now talk to his neighbours, ask his local grocer which aisle the cereal is on, and order a meal without having to struggle to find the right words. But despite leaps and bounds in his grasp of English thanks to NorQuest College’s Language Instruction for Newcomers to Canada (LINC) and its English as a Second Language (ESL) training, Poveda credits the programming for helping him learn so much more. Poveda arrived in Edmonton from Columbia in 2011 via Montreal. His wife and two children came a year later; it was a scary time. He had a few friends, but the littlest of tasks like asking for directions created a lot of anxiety and feelings of loneliness. It turned out to be life-changing. From there, he moved on to the college’s ESL programming, spending one year learning the language in even greater detail. His days now are spent upgrading at NorQuest’s Edmonton Downtown Campus with plans to enter the college’s Pharmacy Technician program next year. Education at NorQuest College comes in all shapes and sizes. Besides academic instruction, the college is keen to supplement students’ practical education with a variety of life skills, health tips, and useful knowledge. ATB Financial has been a valuable supporter of NorQuest College over the years, donating generously to the college’s fundraising campaigns. Their latest donation – which includes a gift to Maximizing Opportunities – The NorQuest Campaign and the creation of the ATB Financial Access Bursary for Indigenous Students – is not only an investment in the college, but a chance for ATB to learn from students. Sandra Huculak, Managing Director, Corporate Social Responsibility, Reputation and Brand for ATB, explains that ATB carefully considered a best approach to working with NorQuest. “We wanted to seize the opportunity to work with NorQuest College for two big reasons,” says Huculak. “One was to share our financial experience with students, and the second was to learn from students. We want to know what challenges and issues students may face with their finances and assist as much as we can. NorQuest has a diverse student population, and so we know this will have benefits for both of us.” In recognition of their generous support and commitment to student learning, a student common area located on the second floor of the Singhmar Centre for Learning has been named the ATB Financial Student Study Lounge. Robert Rosen attributes his compassion for community and success as President and CEO of City Lumber and Millwork to two special people: his parents. In honour of their memory, Robert has contributed $25,000 for a meeting room in the Singhmar Centre for Learning, set to open in fall 2017. The Zita and Jack Rosen Meeting Room will be located on the fourth floor of the new 22,500m2 NorQuest Edmonton Downtown Campus addition. Robert’s parents founded the company nearly 75 years ago. Although it has supplied material for some of the largest construction projects in the world, its foundation is built upon more than profitability, with fundamental values of respect, tolerance, and community. These values are instilled in the company’s office which feature an eclectic variety of photos and art pieces representing different cultures. This, combined with Robert’s welcoming and genuine demeanor, bring a sense of warmth and hominess. It’s the same feeling NorQuest College strives to give its students, who hail from all backgrounds and all walks of life. “Everybody has the right to be treated with dignity,” he says. And after watching how his mother ran the family and took a strong leadership role in the business, Robert places an especially high regard for women. More than half of NorQuest College students are women. And similar to NorQuest, Robert believes lives can be transformed through education. One example is Indigenous women in the trades. “We need to give them a shield of education so they can take care of themselves and their children,” he says. Robert’s longstanding commitment to NorQuest College includes donating to the Tutorial Centre, student success initiatives, and the Alberta Aboriginal Construction Career Centre. With our deep appreciation, NorQuest College recognizes the contributions of our many donors and friends. Your commitment to our students helps us achieve our mission and affects the lives of our students, their families, and our community. SAT Consulting and Construction Inc.